In recent years, CTP flexibles, the Cape Town based and leading South African converter of flexible packaging materials has achieved dramatic expansion of its business. 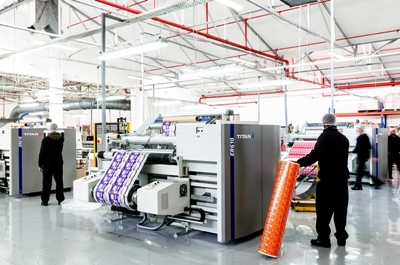 In 2010, the company installed a new 8 colour Fischer & Krecke FP16-S flexo printing press and in order to cope with the increased printing capacity it also installed two Titan ER610 compact slitter rewinders – one 1650mm and one 1350mm wide machine. Further increases in production to serve its expanding ‘blue chip’ customer base led to the addition of three more 1350mm wide Titan ER610’s during the first few months of 2012. This brought the total number of Titan ER610 slitter rewinders at CTP flexibles to five machines – and seven Titan slitters in total, if two older machines are included. The Titan ER610 compact slitter rewinder has been a great success with sales of more than 100 machines worldwide. It has a maximum rewind diameter of 610 mm (24”), a 10” touch screen control system and an integral edge-trim extraction system. The pneumatically controlled braking system provides accurate web tension control and a digital edge-guide system controls lateral movement of the unwind reel to +/- 50 mm (2”). The minimum slit width can be as narrow as 25mm (approx. 1 inch) at speeds up to 450 m/min (1,500 ft/min). Slitting systems available include shear knives, rotary razor (burst) or razor slitting in air or groove. Optional features include an anti-static control system, laser (line) core positioning and an option for shaftless unwind roll pick-up from the floor, which is included on all five Titan ER610 slitters commissioned at CTP flexibles.